If You Don't Mind: Back in business! Okay. I plan on trying my very hardest to keep updating on a regular basis. I MEAN IT I PROMISE. I am rededicating my blog to the blogosphere. I am going to be genuine and authentic. Finally getting serious about my relationship with my blog. My friend Josh and I are blog-accountability-partners. So just like your Jesus accountability partner makes sure you are reading your Bible, your blog accountability partner makes sure you are updating on a regular basis. You both grow together. Three strands of cord (you, accountability partner, the blogosphere) cannot be easily torn! Josh has a great tech related blog and he even has his own domain name (http://www.joshmoles.com). Back two years ago, nobody had Twitter, Josh wrote a short tutorial, listing lots of ways Twitter could be a useful tool. Back then only Ashton Kutcher and my engineering friends and I had a twitter, so I remember doing quite a bit of explaining. Who would've thought... two years later and everyone and their dog (literally) has one. Sort of cool. My dad even uses it for Tulsa Little League updates and rain-out announcements during the summer. 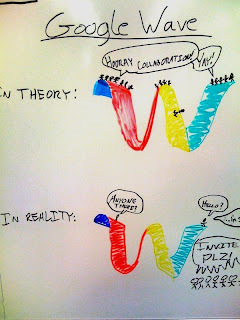 Makes me wonder what is going to happen with Google Wave. Or Google Buzz. Google Wave was sort of a letdown; I can see how it would be useful in a class or work context, if you have a file that needs constant revision. Google Buzz is convenient since I can integrate it with every other Google Application that I use (which is a lot). This is significant and convenient for me and my friends who are fans of anything Google related, but I definitely think there's a significant portion of people that don't really care to have all their Google Applications connected (er... because they don't have any). Wave u l8r, Google Wave. Nice 2 meet u, Google Buzz.